Put on your festive Hawaiian shirt, pull on your dancing shoes and practice the limbo because it’s time for the Beach Party at Allegany State Park. The day kicks off at 3:00 p.m., August 16th, at the Red House Beach area with a Seneca-Salamanca Chamber of Commerce sponsored showcase featuring local vendors and organizations. Come check out the many great things that are available in the local community such as handmade jewelry, bath and body products, all natural honey, and a variety of bake goods. Empire Animal Rescue Society (EARS) will stop by before the music starts with some adoptable pets looking for forever homes. This family-friendly event will feature activities for all ages. 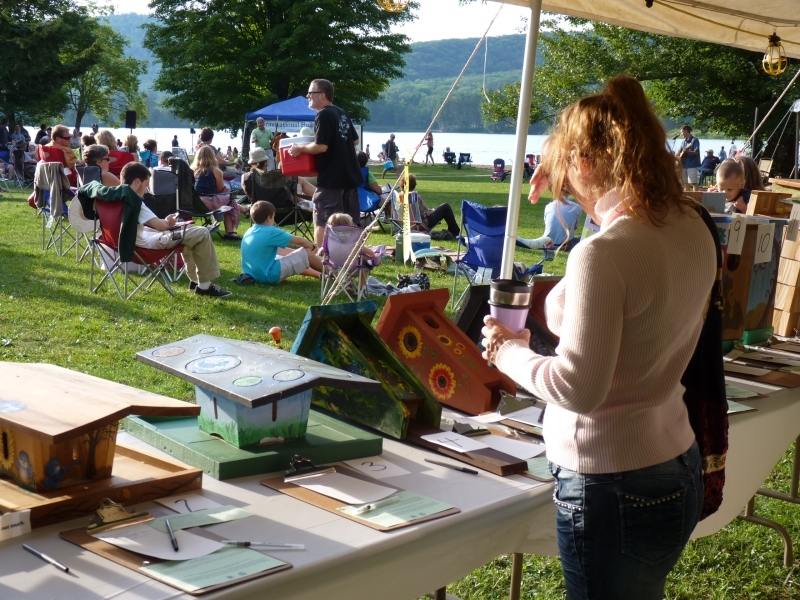 Park Naturalists will be on hand at the “Ask the Naturalist” table. Bring your nature-related questions and check out some cool interactive displays. The Red House Beach will be open to swimming from 11:00 a.m. through 7:45 p.m. and the snack bar will be open from 11:00 a.m. until the start of the fireworks. J-Con Concessions will host a chicken barbecue beginning at 4:00 p.m. (until sold out). Check back for more details as the event gets closer. Be sure to stick around as we end the evening with amazing fireworks over the waters of Red House Lake, a sight not to be missed! Please observe the no parking signs that will be in place that evening. For more information contact the Environmental Education/Recreation Department at 716-354-9101 ext. 236 or check out our Facebook page. Grab the craziest Hawaiian shirt you can find and hula your way to Allegany State Park for our 7th Annual Beach Party! The fun will begin at 6pm at the Red House Beach area. Allegany's own Artist in Residence and Buffalo musician, Kevin McCarthy, will kick off the live music performances. McCarthy has twice been voted top solo artist and was inducted into the Buffalo Music Hall of Fame in 2009. McCarthy will be followed by Lancaster High School's Carnival Kids Steel Orchestra. This unique, award-winning orchestra was established in 1974 and is the third oldest continuing steel drum program in the US. They perform locally, nationally and internationally, making up to 30 appearances each year. In addition to winning multiple awards, the group has released 3 popular CDs! The evening will also feature Mark Baker of Eagle Dream Rehabilitation Center with his live birds of prey, activities for the kids, and a "Craziest Hawaiian Shirt" contest for all ages. We may even break out the limbo stick! There will be a chicken barbeque dinner available for purchase, or feel free to bring your own luau picnic supper. A spectacular fireworks display will light the skies over Red House Lake in the evening. New this year, event attendees can check out a local vendor area sponsored by the Seneca Salamanca Chamber of Commerce.